Photo and Art Reproduction for the Artsy! Winter weather policy: Kansas weather is unpredictable. If the local TV station WIBW is announcing closings we will also be closed. Orders will be delayed accordingly. You believe it’s worth printing, and we agree. No fading for a lifetime! Receive high-quality paper or canvas (your choice) created locally. Made in the U.S.A., our frames, many made locally, (including the basswood stretcher bars) are chosen for the best beauty, durability and quality you’ll find anywhere. Local accountability, we are right here, a part of your community. You get a better value because our prices START LOWER! We brag about the quality of our work! We’ll brag about yours, too. 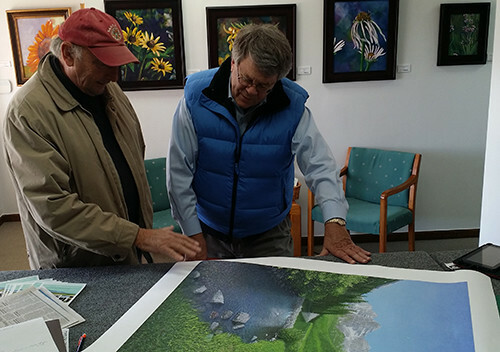 An in-house artist ensures the best quality print available of your work! Save shipping charges by visiting our studio to pick up your order!